It's easy to decide to have a camera modified to photograph in infrared. It's harder to decide what filter to choose. If you are having your camera converted by Life Pixel, you can choose between three infrared filters. The "standard" or most common choice is the 720nm (nanometer) infrared filter. It's the same type of filter I used when I first started with digital infrared photography years ago. You can have a camera modified using this standard filter, and often create the "blue sky" effect as shown below. The "deep black and white" filter, 830nm filter creates very contrasty black and white infrared images. The blue sky effect isn't possible, as the least amount of visible light can reach the camera sensor. The "enhanced color" infrared filter, 665nm allows the most visible light to reach the camera sensor. You have the benefit of infrared light creating a traditional black and white infrared photograph as shown below Or, you can work with the "color" creatively and enhance your image with Photoshop plug-ins as shown with the first colorful image. An infrared converted camera can be hand held and you can take pictures as you ordinarily would with normal exposure times. This allows for more flexibility and shooting on the go. You can convert anything from a compact camera to digital SLR. 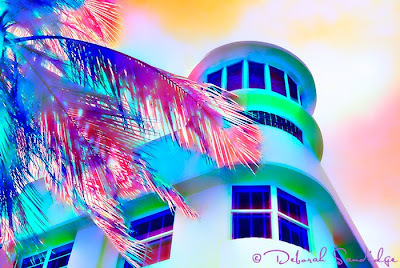 The enhanced color infrared filter is my favorite, although I do use a camera with a standard infrared filter too. Check with Life Pixel to see what they recommend for your particular camera. 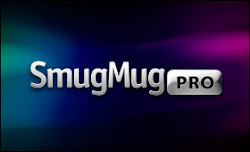 You can use this code at checkout for a discount - DEB. If you want to read more about the subject, check out my book Digital Infrared Photography published by Wiley. Ready for interactive learning and fun? 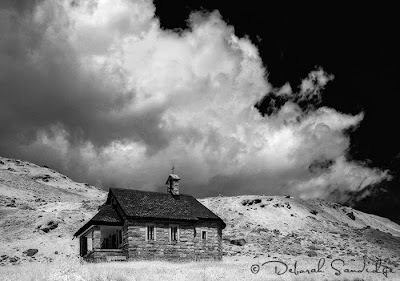 Sign up for Digital Infrared Photography, an online course starting November 4th at BetterPhoto.